PINEHURST, NC (July 4, 2017) - With 54-hole tallies of 213 Tyler Jones and Presley Baggett have won the North and South Junior Champions. On Wednesday the Boys's Division played their final round on Pinehurst No. 8 and for much of the day the tournament was up for grabs before Jones ultimately held on for a one-stroke victory. Jones was able to hold off Grigg Holden (Coastal Carolina commit) and Tianyu WU both of whom finished tied for second with a total of 214 while Deon Germishuys (2018 South African Match Play winner) and Spencer Oxendine (NC State commit) shared fourth at 216. In the Girls' Division, with the final round contested on Pinehurst No. 8, Presley Baggett (LSU commit) finished four-strokes ahead of her nearest competitor with defending champion Aneka Seumantafa taking second at 217, Chloe Schiavone (2018 Florida Women's Four-Ball winner) with a 220 mark was third and in a tie for fourth at 221 it was Rylea Marcum (Western Kentucky commit); Nicole Adam (North Carolina commit). 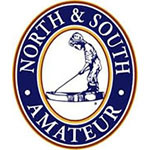 Part of the annual North & South series of tournaments at Pinehurst that include Men's, Women's, Juniors and Seniors. Entries are open to male and female golfers who are between the ages of 15 and 18 (Ages as of tournament start). Contestants must not have reached their nineteenth birthday by start of tournament, OR must not have started college. All applicants must conform to the USGA Rules of Amateur Status and meet the requirements of the USGA Gender Policy. FORMAT: 54-holes of stroke play will determine the Champion. Play will be divided into two divisions: Boys and Girls. A full field will consist of 90 boys and 90 girls.